Is zero plastics really the answer? Since Sir David Attenborough’s Blue Planet series hit television screens, plastic has been high on the news agenda. Headlines about a ‘plastic crisis’ are now a daily occurrence, with incidents of plastic littering the environment, damaging wildlife and destroying oceans, a resounding image. Against this backdrop, it’s easy to see why some commentators are calling for a ‘zero plastics’ policy – but is that really the answer? Here, we take a closer look at the issue. The invention of plastic was a ground-breaking development and as a packaging material, it’s easy to see why its popularity has soared among manufacturers and producers. As a material, plastic is extremely flexible and can easily be moulded into all kinds of shapes and sizes, to suit the product it contains. Its strength and durability mean it protects products whilst at the same time being lightweight enough for retail employees to stack on shelves and for consumers to carry. Plastic also takes up less space and is far lighter than alternatives, such as glass. This means more products contained in plastic packaging can be stored and transported at the same time, and more items can also be crammed into one truck, meaning fewer vehicles and less fuel required for transportation. The result being that plastic actually has a lower carbon footprint than glass. While glass may seem a viable alternative, in reality, much less glass is recycled than plastic - mainly due to the amount of energy required to recycle glass compared to plastic. The food and drink industry accounts for a high volume of all plastic packaging, particularly within the food-to-go market. Whilst efforts to reduce the amount of unnecessary plastic being used are to be welcomed, finding a viable alternative that can match the capabilities of plastic, remains a key challenge. The main benefit of plastic in the food industry is to dramatically increase the shelf-life of food products, so they maintain their quality and freshness even under extreme hot or cold temperatures, making global imports and exports possible. Preserving food products for longer plays a huge role in combatting the other global problem of reducing food waste. Wrapping a cucumber in plastic packaging, for example, can ensure the product lasts for up to 10 days compared to just 2 without a plastic wrapper. As well as preserving the freshness of food products, plastic packaging also protects products from the dangers of contamination, as well as reducing the risk of products being damaged during transit. Both these benefits again help to reduce the amount of wasted food and unsellable produce. One area where progress is being made within the industry, is in relation to single-use plastics. Manufacturers are increasingly making a commitment to ban single-use plastics. In the pub sector, for example, plastic straws have now been swapped for paper alternatives. Whilst changes such as this are positive and a visual sign of change, there is still a waste hierarchy that needs to be factored in. As it’s a fact that whether we reduce, reuse, recycle, recover or dispose of any material, each of these choices has an implication and an associated impact on the environment. All materials will have to go through the waste stream at some point in their lifecycle and everything has a carbon footprint. So, any decision to switch from plastic to another material must carefully be considered. Otherwise, in the future, there is a danger that we simply replace one issue with another. The British Plastics Federation (BPF) even claims that‘without plastics, packaging weight could increase by as much as 400%, production and energy costs could double, and material wastage increase by 150%.’ Whether or not this assessment turns out to be correct, it is important to acknowledge that any plastic alternatives will also have an environmental impact. So, what is the answer? Is there a way to retain the benefits of plastics, while protecting the planet? It seems to us that right now, ensuring zero plastics reach landfill needs to be the priority, rather than simply aiming for zero use of plastics in packaging. 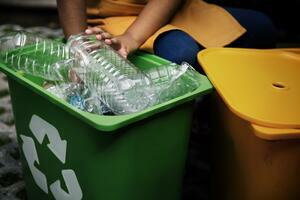 Achieving this aim comes down to the UK’s recycling capabilities. Currently, recycling systems are widely disjointed, with different collection policies and levels of capacity in every county. What needs to happen – and fast – is that there is a joined-up approach to recycling household waste. This needs to be done in tandem with educating people on what kinds of packaging can be recycled and how to prepare those items for recycling. The fact that the rules can vary so drastically between areas doesn’t help the cause. A more sustainable system for the recycling/reuse of plastics is required, with a shift from a linear plastics economy (where single-use plastics are sent straight to landfill) to a more circular system, where plastic is kept in the economy and out of the natural environment. Having reviewed the benefits of plastic as a resource, what the alternatives are and the problems with the current recycling system, it is clear there is still much work that needs to be done. While ‘zero plastics’ may on face value appear to be the solution, it’s not quite that simple. Any decisions that are made about the future of plastics need to be measured and carefully considered, rather than being simply a knee-jerk reaction, otherwise, we risk ending up with an even greater environmental crisis than the one we face today. At SEALPAC UK we are committed to helping to reduce the amount of unnecessary plastic used within the packaging industry.